The Bay of Bengal Large Marine Ecosystem (BoBLME) Project is laying the foundations for a coordinated program of action designed to better the lives of the coastal populations in this area, through improved management of the environment, its resources and trans-boundary issues. 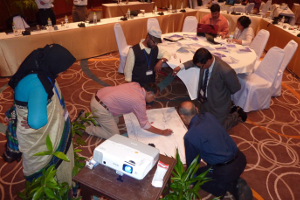 Scientists from Bangladesh, India, Indonesia, Malaysia, Maldives, Myanmar, Sri Lanka and Thailand participated in a workshop supported by the Crawford Fund to develop a characterisation of the Bay of Bengal ecosystems and understand trans-boundary issues. The scientists were instructed in a process for developing an ecosystem characterisation using methods developed by CSIRO. Participants gained a broad understanding of how ecosystems function and factors impacting variability, productivity, habitats and species. “As a result of the workshop, the process of identifying and describing the Bay of Bengal is well underway, including identifying assets and threats of the region,” said Ms Donna Hayes, CSIRO. A report describing ecosystems within the Bay of Bengal was developed, along with a range of presentations. These products can be used by various BoBLME management agencies to improve the sustainable use of marine ecosystems. 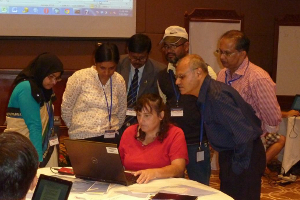 The workshop further served to link scientists from a range of different disciplines in BoBLME countries and Australia.